﻿ INDONESIA MASTERS R32 – Top seed Okuhara stopped in the first round! Struggling with errors during her match, women’s singles world #2 Nozomi Okuhara lost in straight games to China’s Chen Xiaoxin. 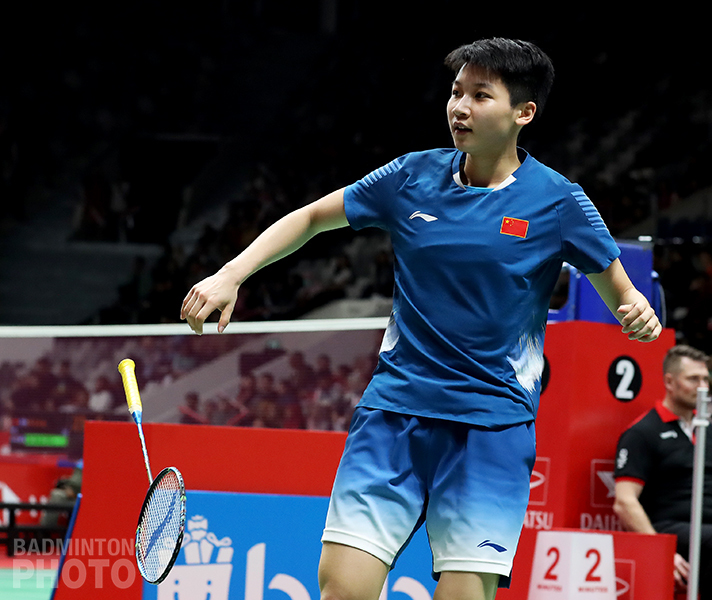 The disappointment for Nozomi Okuhara at last week’s Malaysia Masters followed her to the Indonesia Masters on Wednesday. Playing on Court 3, Okuhara’s opponent Chen Xiaoxin (pictured left) played very well and caused the top seed all sorts of problems. In the first game, the score was tight. Chen dominated the score until she ended the first game 21-18. The second game was going Okuhara’s way at first. The top seed led most of the way, in fact; however, at the end she could not play her best performance. It ended by the score 21-17 for Chen in 41 minutes. Nozomi Okuhara (pictured right) admitted that her own errors during the match were key to the loss: “The match was not good for me. I felt disappointed with my own performance because I could not calm myself down and lost in terms of technique,” said the Japanese star, adding that while there were no injury problems, insufficient rest from the previous competitions has left her exhausted. This second loss after the Malaysia Masters, will mark the beginning of a long rest and preparation for the next tournament: “I could not play my best performance in Malaysia and Indonesia, so I now want to focus on resting and preparing for the next tournament.” The 23-year-old shuttler has decided to rest in February to focus on All England on March. Playing on court 1, Fitriani (pictured below) was confident in her win over Denmark’s Line Kjaersfeldt. Fitriani played well in the first game, leading in the score until she had taken it 21-16. “I tried to enjoy and relax in playing because I didn’t think my opponent would be easy to beat since she is so much taller than me,” Fitriani said afterward. Although Fitriani was able to finish the second game 21-15, she faced difficulties to beat her opponent: “I had some errors in service and it will be my homework to be concentrate on later. The posture of my opponent was also a problem for me, so I need to be prepared physically to always be ready to defend against the attacks,” said the home favourite, adding that she played hastily at the end of the second game because she wanted to finish the match quickly.